Mary Jurek Fidelia Square Bowl, 5"
Handcrafted glass heart-shaped bowl. Ruffled edges hand painted with platinum. 8"W. Durable; chip resistant. Dishwasher safe. Made in the USA. 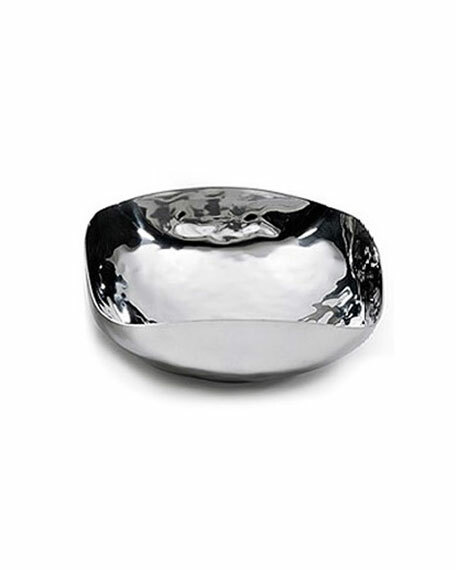 Stainless steel champagne bowl from the Manhattan bar collection. Approx. 16"Dia. x 9"H (400 x 230 mm). Dishwasher safe. Imported. Stainless steel bowl. Approximately 6.25"Dia. x 3"T. Mirror-polished finish. Hand wash. Imported. Surreal bowl. High-fired porcelain. Sheer, high-gloss glaze finish. 9"Dia. x 5"T. Microwave and top-rack dishwasher safe. Imported.